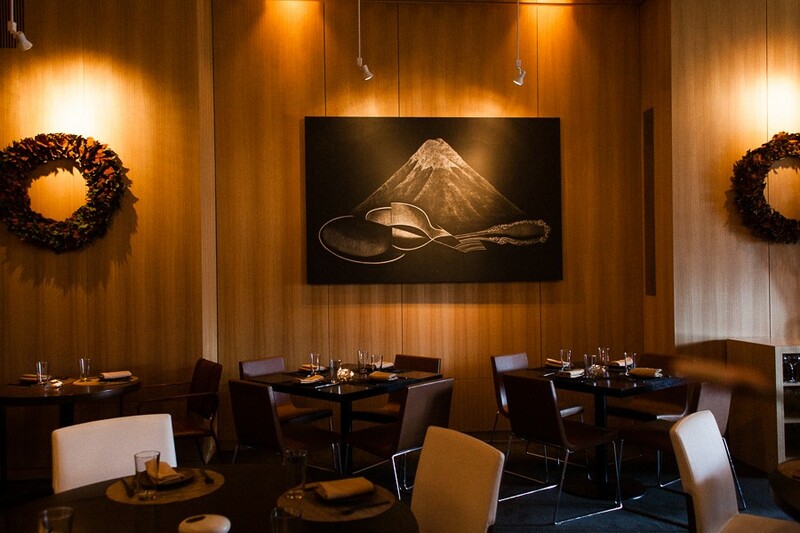 Chef Hisanobu Osaka’s residency explores the affinities of two great world cuisines. Danielle A. Scruggs Chef Hisanobu Osaka brought his signature uni carbonara to Intro from Japonais. 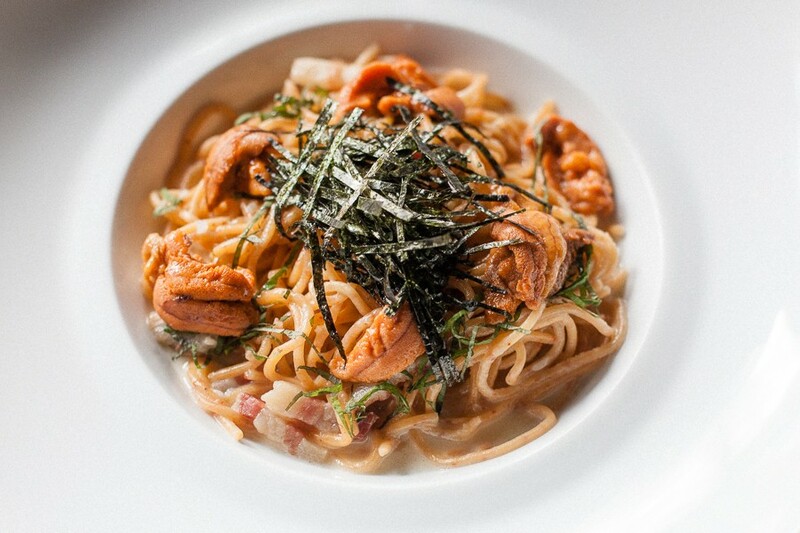 The Japanese fascination with Italian food goes back decades, but it wasn't until the 90s that itameshi, as it was known, came into its own and informal, inexpensive Italian food prepared with quintessentially Japanese ingredients supplanted high-end French as the exotic foreign obsession della giornata. It's difficult to imagine two world cuisines more suited to one another, if only for their mutual fidelity to pasta. As compelling as it was, this marriage didn't make much of a go of it here in Chicago. 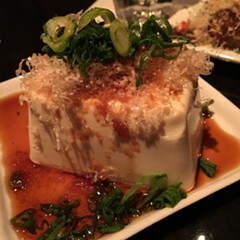 Years back there were rumors of a Japanese chef who'd opened a trattoria in an Arlington Heights strip mall, serving pasta with fish eggs and butter, among other experiments, but by the time I'd tracked it down it was gone. 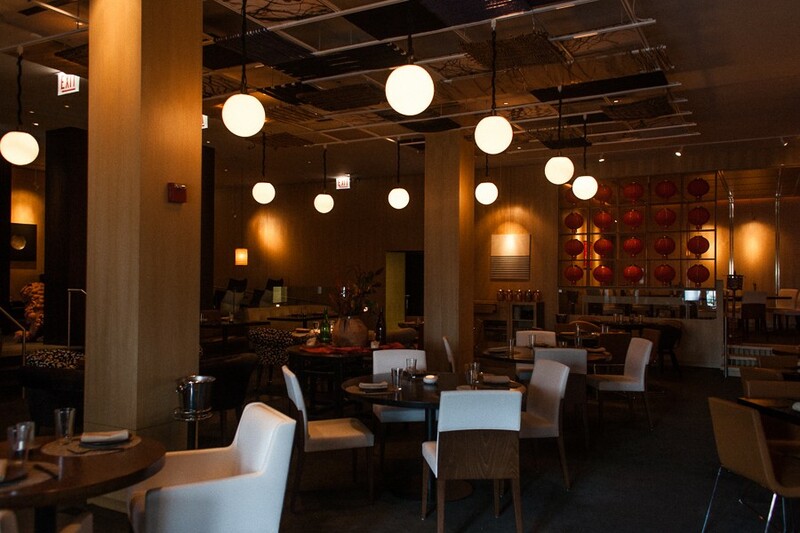 Save a few representations here and there, say, at the late Japonais by Morimoto (gyoza in puttanesca, uni carbonara) and at the still extant Momotaro, where Mark Hellyar's buttery mentaiko spaghetti is still a thrilling bowl of noodles, niente, nani mo. So when Lettuce Entertain You announced that the sixth incarnation of its ever-changing Intro would be playing host to a Japanese's chef's passion for Italian food, I decided yet again to break my self-imposed moratorium on new Italian restaurants in 2016 and check it out. Chef Hisanobu Osaka launched the aforementioned Japonais and a number of Masaharu Morimoto's restaurants before signing on with LEYE and contributing to Naoki and Wow Bao. But Osaka is a native of Kagawa, Japan, and though he worked in fine dining in his home country during the heyday of itameshi, he was fascinated by the variety of pastas in the more casual style, and it was with this in mind that he designed the pastas for his Japanese Trattoria menu. 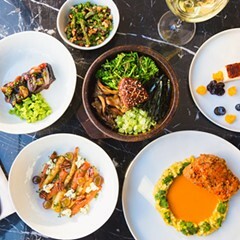 Running concurrently with Stephen Gillanders's dim sum menu, Osaka's selection of dishes is rather focused: mainly pastas and secondi, a few contorni and insalata, and a handful of appetizers and antipasti. The latter are appealing enough, consisting of well-known bites like crispy arancini composed of sushi rice studded with bits of Japanese pickle, tangy aioli spiked with fermented beans on the side. In fact, the Japanese elements of a good number of these little dishes are distinguished predominately by some type of dipping sauce. That's true of likably greasy tempura-fried calamari, tossed with fried brussels-sprout leaves and served with a ketchupy tomato-ponzu sauce. Even more subdued is a trio of soft chicken meatballs, perhaps more typical of the robata grill but here soaking in a straightforward red sauce, with more brassica snuck in rather than the promised Japanese eggplant. 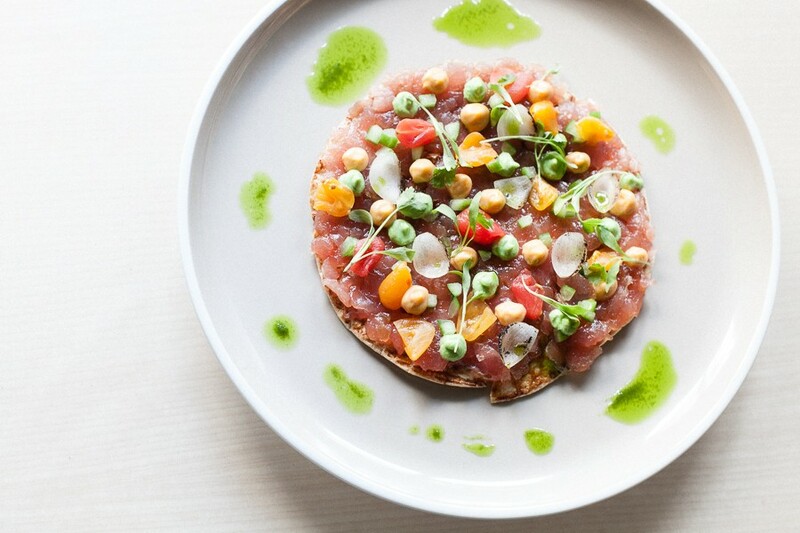 First courses include a tuna pizza similar to something Osaka was knocking out back at Japonais, a thin, crispy, tortilla-like flatbread forming the vehicle for a layer of tuna carpaccio dotted with dabs of wasabi aioli, charred onion, and pickled tomato. Speaking of tomato, there's the surprising inclusion of a caprese salad, a layer of cool, creamy house-made tofu fairly dominating the dull winter grape tomatoes, a dish eight months away from being even close to appropriate. But then it's on to what's really the main event of Osaka's menu: the pasta, including what appears to be something of a signature: uni "carbonara," another dish the chef has brought from Japonais. There it was bacon and the reproductive structures of the sea urchin contributing to a rich creamy pasta, amounting to a sybaritic delight. 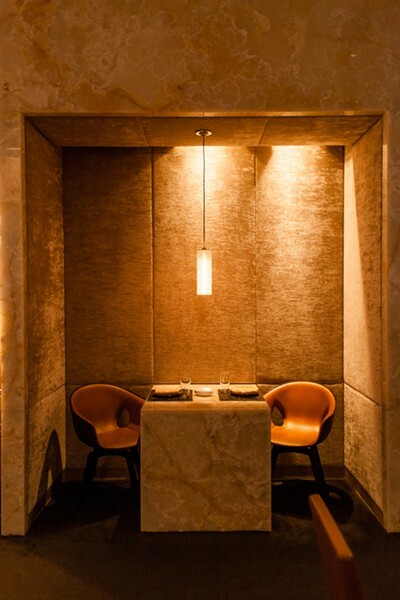 But at Intro something goes wrong: the sauce and the pasta are appropriately luxurious, but the uni themselves are small and withered, nothing at all like the standard at Morimoto—or, for that matter, like Lettuce's boilerplate publicity photos of the dish. This plate of pasta costs roughly $30, a price point that stings like the spine of one of these unfortunate creatures. Thankfully the rest of the pastas are more impressive. 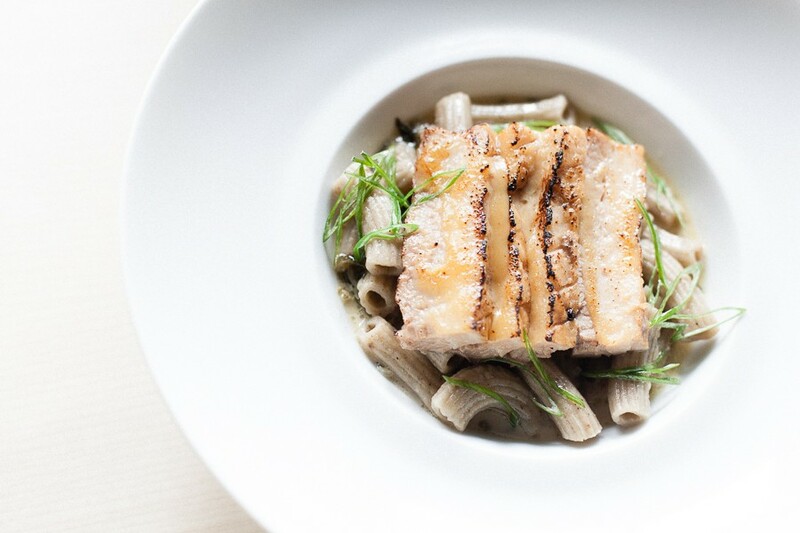 Rigatoni with pork belly pays direct homage to tonkotsu ramen; the slurpable oleaginous broth has a gelatinous sheen and teems with melting belly and springy rigatoni decorated with slivers of scallion. Thick jet-black squid-ink linguine in an arrabbiata sauce that's more like mild irritation than full-on spicy-meatball fury features a half Maine lobster splayed on top, meaty tail and inedible forebody both, presenting an arresting bowl. 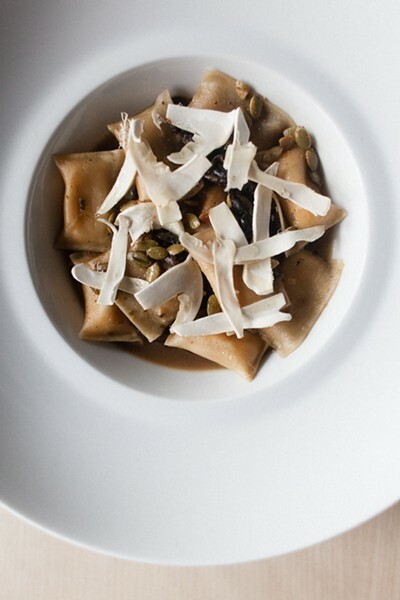 Stiff agnolotti stuffed with kabocha avoids the cloying trap squash-filled pastas tend to fall into, instead contributing to an adult savoriness with matsutake mushrooms and a mushroom dashi broth. Perhaps a subtle Japanese influence tends to restrain what would normally be bold Italian pastas, but their unusually large size—the traditional pasta course isn't generally a shareable portion—seems to balance that out. 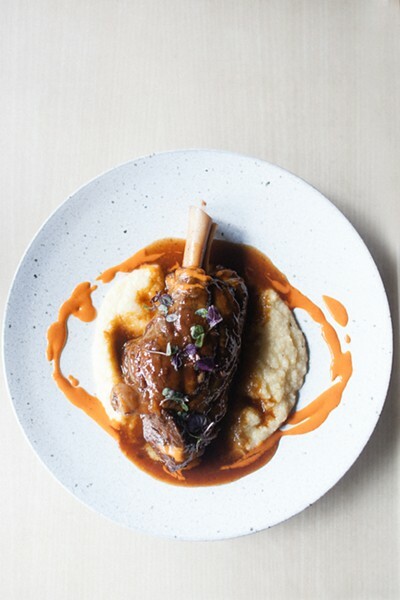 That's complicated by the amply-sized secondi, particularly a massive, indulgently tender and fatty lamb shank mounted on a bed of polenta and drenched with an electrifying citrusy sauce spiked with sansho pepper. A bland but texturally compelling chicken saltimbocca features silky breasts armored in a crunchy tonkatsu-style panko breading with the appropriate curried gravy. Among a quartet of desserts, a glutinous matcha-dusted panna cotta seems a nod to rice-cake mochi, the green tea's bitterness playing off the rich custard. And warm coconut fritters with a squiggle of yuzu cream play not so much like a doughnut as a warm, moist fried cake. 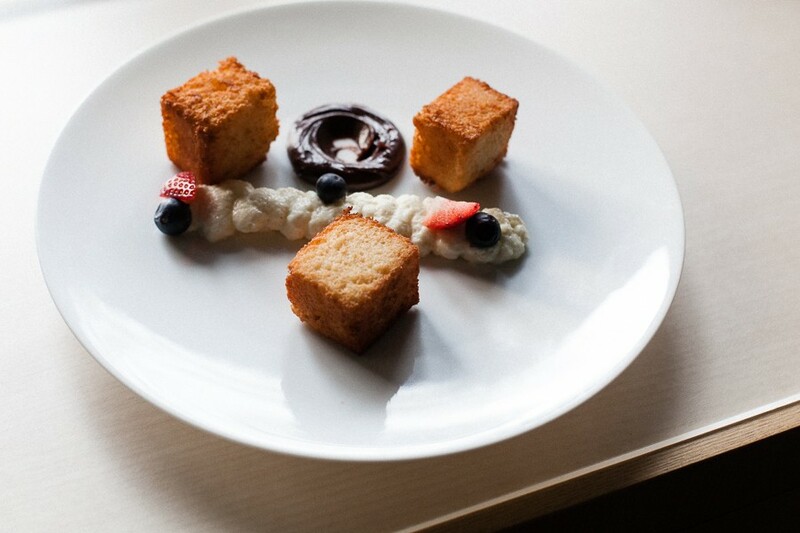 But I can't understand the decision to garnish either of these deserts with hard, flavorless November strawberries. Strawberries are terrible right now. This is known. A short list of mostly classic cocktails built on Asian ingredients (particularly Japanese whiskey) gives way to an accessible wine list with a few good deals in the $40-$60 range. 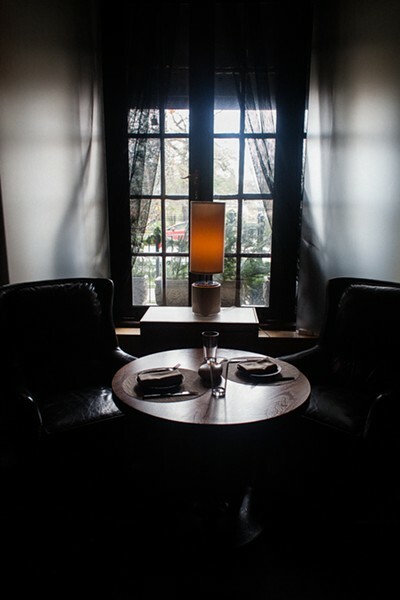 Former Intro chef Stephen Gillanders’s vision alights on a gentrifying 18th Street.